Valentine’s Day can feel like a touchy subject. Most people either love it or hate it, but why not try and get the best out of it? Whether you’re stumped on where to take your significant other or you’re flying solo and need suggestions, we’ve got you! Here are a few suggestions for special Valentine’s dinners happening along the Emerald Coast. From 6-8pm on Valentine’s Day, Dewey Destin’s Harborside restaurant is hosting a wine pairing event. Along with the wine, they will feature small plate creations by Chef Jim Shirah. Tickets are $30 in advance and $35 at the door. All tickets can be purchased at the hostess stand at Dewey Destin’s Harborside Restaurant or by calling 850-837-7525! Looking for an extra special Valentine’s date? 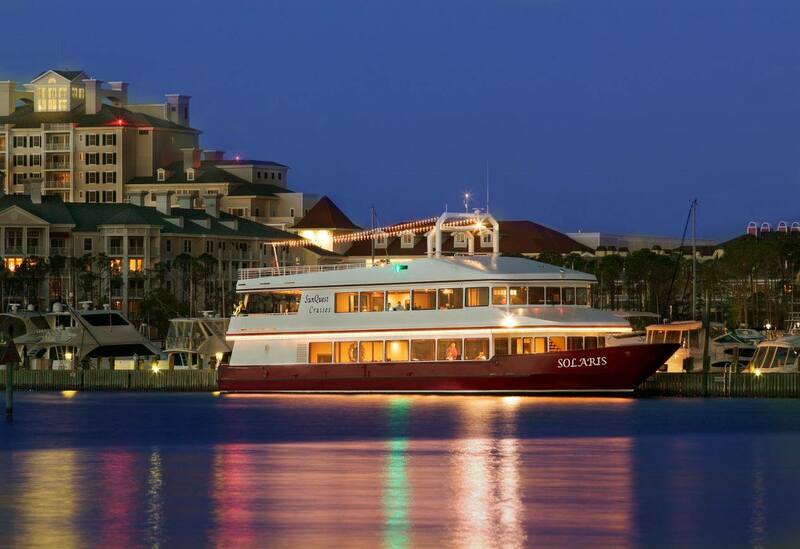 Consider a three hour dinner cruise on the Solaris. The Solaris is located in the marina at the Sandestin Golf and Beach Resort. This romantic cruise starts at $165 per couple ($82.50 per guest) and includes a three hour cruise, three course meal, live entertainment, and iced tea, coffee, and water. There is a full bar on the boat to purchase additional drinks from. If a window table tickles your fancy, it’s an extra $50. Also, if you want to book this dinner cruise, but you can’t make it on Valentine’s Day, the same cruise is available on the 15th and 16th of February as well. The Gulf on Okaloosa Island is hosting a five course Valentine’s Day dinner for $100 per couple before tax and gratuity. The dinner will feature five courses created by their executive chef, along with a complimentary champagne toast and a rose. There is limited seating for this event and reservations are necessary. You can purchase tickets until February 12 by e-mailing magic-oi@thegulf.com or calling 850-387-1300. Taste in Downtown Fort Walton Beach is hosting a total tapas experience for Valentine’s Day! Starting at 5pm and for just $35, the experience will include a glass of champagne, a cold bar buffet, and hot tapas (including goat cheese empanadas, yum!) that will be passed throughout your dining experience. Live music will also be part of the experience and reservations are recommended! Enjoy a dinner complete with wine pairings at the Twisted Grape Café and Wine Bar in Shalimar. The cost is only $75 a couple and includes a four course meal with their wine pairings. There will also be live music and seating starts at 5PM. Reservations are required. Grab a friend and head to Rockin’ Tacos all day Happy Hour! Matt and Kim at Vinyl Music Hall in Pensacola. Go eat dinner at your favorite restaurant with a friend or by yourself. Enjoy a fun workout by rock climbing at Rock Out Climbing Gym. The Total Tapas Experience at Taste would still be great with a friend! Cook something special, cuddle your pet, and watch your favorite show. Do literally anything and be thankful for another day to experience this beautiful life.